Platform Guards. We’ve heard these devices called many different names during our time in the business. You might recognize them as Toe Guards or even Aprons. Platform Guards is how the ASME A17.1 Elevator Code (Rule 2.15.9) refers to them. These guards protect passengers from being exposed to open hoistways under the elevator car. This, of course, happens when the doors are opened and the elevator is not at the landing. When this occurs, the design of the platform guards reduces the shearing action of the threshold. 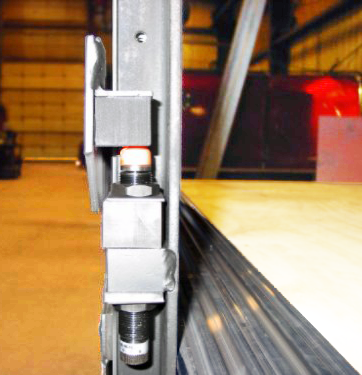 These guards are designed as a steel plate with a flat and angled surface and secured to the edge of the elevator car platform (or the hoistway edge of the sill) of the lowest terminal landing. At Gillespie Corporation, we’ve developed a Multi-Section Telescoping Platform Guard. Our design satisfies Elevator Code Rule 2.15.9.2(a) which describes that elevators having to comply with rule 2.19.2.2(b) must have a car apron that is not less than 48” in height. As the elevator car approaches the lowest landing, the Multi-Section Telescoping Platform Guard will collapse into itself as the car enters. When the car pulls away from the lowest landing, the platform guard will extend to its full 48” height. For new or existing installations, Gillespie can custom design and build a telescoping platform guard to suit any elevator. To do so, we’ll need the dimensions of the car, the width of the car door (or doors if there is more than one entrance), and pit depth. Telescoping platform guards are available primed, powder coated, in stainless steel or other metallic materials as requested. For elevators in glass hoistways, it may be desirable to consider the aesthetics of the platform guard and chose the material and finish accordingly. For more information on our Multi-Section Telescoping Platform Guards, email us at sales@gillespiecorp.com or call 413-967-4980. Let’s chat!